While 2018 marks the centenary of the death of the last captive Carolina parakeet – North America's only native parrot, a team of researchers have shed new light on the previously known geographical range of the species, which was officially declared extinct in 1920. 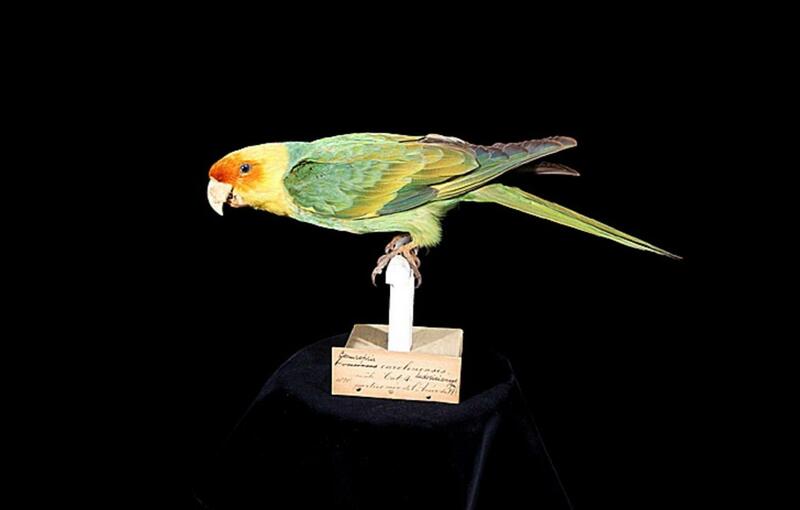 Combining observations and specimen data, the new Carolina parakeet occurrence dataset, recently published in the open access Biodiversity Data Journal by Dr Kevin Burgio, , Dr Colin Carlson, University of Maryland and Georgetown University, and Dr Alexander Bond, Natural History Museum of London, is the most comprehensive ever produced. The new study provides unprecedented information on the birds range providing a window into the past ecology of a lost species. "Making these data freely available to other researchers will hopefully help unlock the mysteries surrounding the extinction and ecology of this iconic species. Parrots are the most at-risk group of birds and anything we can learn about past extinctions may be useful going forward," says the study's lead author, Kevin Burgio. The observational recordings included in the study have been gleaned from a wide variety of sources, including the correspondence of well-known historical figures such as Thomas Jefferson and the explorers Lewis and Clark. The study team referenced recorded sightings spanning nearly 400 years. The oldest recorded sighting dates back to 1564, and was found in a description of the current state of Florida written by Rene Laudonniere in 1602. Alongside the written accounts, the researchers included location data from museum specimens. These include 25 bird skins from the Natural History Museum's Tring site, whose skin collection is the second largest of its kind in the world, with almost 750,000 specimens representing about 95 per cent of the world's bird species. Thereby, the study proves what invaluable resources museum collections can be. "The unique combination of historical research and museum specimens is the only way we can learn about the range of this now-extinct species. Museums are archives of the natural world and research collections like that of the Natural History Museum are incredibly important in helping to increase our understanding of biodiversity conservation and extinction," says Alex Bond. "By digitising museum collections, we can unlock the potential of millions of specimens, helping us to answer some of today's big questions in biodiversity science and conservation." It is hoped that this research will be the beginning of a wider reaching work that will explore further into the ecology of this long lost species.